The second half of the 2014 NFL campaign is fully underway and we all know what that means: the run to the playoffs is on. But based off of last week, there are still some questions. 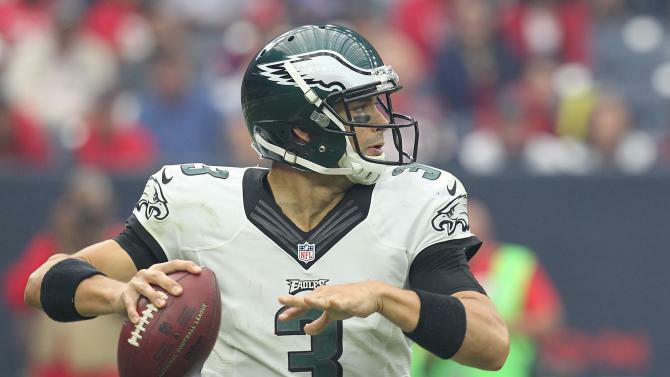 Can Mark Sanchez (pictured above) hold down the fort for the Eagles with Nick Foles out with a broken collarbone? How long will the Cowboys be without Tony Romo? Are the Chargers falling apart after a blowout loss to Miami? May New England be the team to beat in the AFC now? When will the Seahawks look impressive again? Here are my Week 10 picks. All teams in the AFC North are within about a game of each other, meaning that every divisional game now has additional meaning. Both of the Ohio teams come in having won two in a row but of the two, at least the Bengals have defeated a potential playoff team in that stretch (Baltimore). The Browns have been a surprise but I do think they have some smoke and mirrors and I'm not sold they are a legitimate contender in the division. I like Cincinnati here. The Steelers' roll continues as they have now won three straight after smoking the Ravens on Sunday night, their second straight sizable victory. Ben Roethlisberger was amazing once again as he threw a heart 340 yards with six touchdowns, and may just be putting himself into the sleeper category for NFL MVP. On the other hand, the Jets lost again, this time in Kansas City. They didn't look as bad as they did the week before but even then, they lost by two touchdowns. Pittsburgh rolls. Talk about a real barn-burner of a game right here. These two have combined to lose nine games in a row (five for Atlanta, four for Tampa Bay) and are both doing their part to play themselves out of an eminently winnable division race in the NFC South. Matt Ryan should be able to find success in the air against a miserable Buccaneer pass defense and that should be enough. The Ravens will enter Nashville with a two-game losing streak but they will leave it on a one-game winning streak. Let's face it: the Titans are simply not very good and now they are putting their immediate future of the hands of a rookie quarterback in Zach Mettenberger, who I do like but is still relatively raw. Baltimore will get the win. Jason Garrett thinks Tony Romo is going to be good to go this Sunday in London but I would guess he is going to be a game-time decision at best. We saw how much the Cowboys need him as the Cowboys blew an early 10-0 behind the rhythmic stylings of the immortal Brandon Weeden. But even with Weeden over center, I would be surprised to see Dallas fall to Jacksonville but I do think it may be sneaky close. Even after their surprising 2013 campaign, I'm not sure many thought that this game at this moment would have legitimate AFC playoff implications. They have combined for five wins in a row (Buffalo with two and KC with three) and would be tied for the last wild card spot with the Chiefs having a tiebreaker. This should be a good one but I think that Kansas City has been playing a little better of late and will get the win. These teams come in on divergent paths. The Saints have put together a pair of impressive wins in a row over Green Bay at home and Carolina in Charlotte, while Frisco has dropped a pair of games in a row as they got blown out in Denver and dropped a stunner to St. Louis at home when Colin Kaepernick fumbled at the goal line at the end of the game. I think the Saints at home will pull it out. This should be a good one as both teams having been looking sharp of late and both feature strong defensive units. And since this is a matchup with a pair of quality defenses, I think this will come down to quarterback play. In that regard, I may actually go with Ryan Tannehill. Yes, Matthew Stafford is more talented and he has flashier weapons but even then, he can look shaky every now and again. Tannehill has played efficient football this year and I think he will lead the Dolphins to a nice road win. One has to give Tony Sparano some credit as the Raiders have played better under him than they were under Dennis Allen. Of course, 0-8 is still 0-8 and I don't see that many opportunities for wins going forward. The Patriots did have their way with the Broncos on Sunday night but that doesn't change that they will be my Lock of the Week right here. As I mentioned in the introduction to my picks, the Seahawks have not looked all that impressive in over a month since the impressive home win over the Broncos in Week 3. They will face New York who have looked pretty mediocre in losing three in a row after winning three in a row. I don't think with the way they are playing that the Giants can go on the road and get a big win, let alone in a place like Seattle. Bruce Arians deserves a ton of credit for leading the Cardinals to the best record in the league even with their starting quarterback, Carson Palmer, being out for a month earlier in the year. The defense has been strong, Palmer has taken care of the football and been efficient, and they have found ways to win. I still don't know how the Rams defeated the 49ers on Sunday and they have been cagey this year, but I like the Cards to continue their winning ways. The last time we saw the Packers, they were getting blown out by the Saints in the Superdome prior to their bye week. Are the Packers a fraud? Or was that an example of going into an hostile environment against an underachieving club that desperately needing a win, and getting taken advantage of as such. I think it's the latter, although their defense may still have some holes that could be exploited. However, the Bears are a mess right now, having dropped two in a row and now having their coach dodge rumors his job security may be tenuous. I do think this will be closer than the first matchup, but Green Bay still wins. The Panthers have looked miserable offensively these past few weeks as they have dropped three in a row. Yes, Cam Newton lacks help around him but even then, he hasn't played well at all of late. Their defense has been disappointing as well and even the advantages one would think they may have against Mark Sanchez, considering it is Mark Sanchez, may not be there considering how well Sanchez played in relief of Nick Foles after he broke his collarbone. I like Philadelphia. Cowboys will destroy the lowly Jaguars : Cowboys 45 Jaguars 0. How About Them Cowboys Super Bowl Bound! ! I think the Bills have home-field advantage, Ben. Chiefs anyway, as you said.